Has it really been 10 years since Ghost World was released? And is it possible that I have been a member of the San Diego Film Critics Society for a decade? 2001 was the first time I cast my ballot as a voting member in our December "Best Of" roundup. It was the year Ghost World swept the voters. In addition to taking home Best Picture, the film won Best Director (Terry Zwigoff), Best Adapted Screenplay (Zwigoff and Daniel Clowes) and Best Actress (Thora Birch), all of whom were in attendance at our (semi) annual awards luncheon. 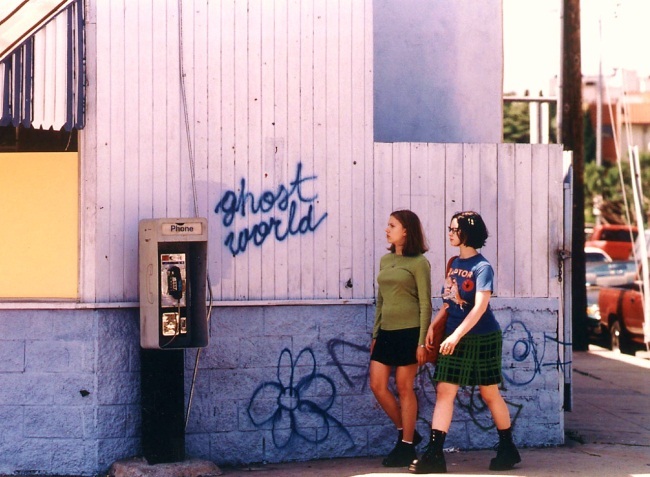 How much more enjoyable (and enriching) would our summer cinema solstice be if all comic book adaptations were as sharp and richly detailed as Ghost World? Normally, I wouldn't go near Comic-Con on a bet. This year, I am thrilled to announce that the SDFCS, in conjunction with Reading Cinemas and Fantagraphics Books, will interrupt San Diego's yearly celebration of everything that's wrong with contemporary cinema by showing that rarity of rarities: a masterpiece adapted from a comic book. The 10th anniversary screening of Ghost World will take place during Comic-Con weekend, Saturday, July 23 at 9 p.m., at Reading Cinemas Gaslamp 15. Admission is only $5.00! Several members of the SDFCS will be on hand for to introduce the film and conduct a post-show discussion and Q&A. And did I mention that the film will be screened in 35mm? You have me to thank for that! Geeks take heart! There is no way that all of you will be able to attend the "special" advance screening of Cowboys vs. Aliens, so why bother trying? You'll have ample opportunity to see Jon Favreau's latest gift to cinema. Why not see a comic book movie without explosions and superheros? It just might act as smelling salts. We are still trying to get some of the film's crew and/or talent to put in a personal appearance, but Steve Buscemi is currently doing God's work on Martin Scorsese's Boardwalk Empire and Scarlett Johansson's phone must have been off the hook when I tried calling her. Joaquin_de_la_Mesa July 13, 2011 @ 11:49 a.m. I must have been really drunk 10 years ago. I don't remember this movie. I loved the trailer, though. Maybe I'll see you at the screening, Marks. Scott Marks July 13, 2011 @ 12:37 p.m.
quillpena July 13, 2011 @ 8:54 p.m.
"Oh, my God. Look at all these 'creeps,'" and, "What, are you in slow motion? Come on move it," are just two of favorite lines from "Ghost World." I love this movie, and the graphic novel as well. Thora and Scarlett look great, Steve Buscemi, Teri Garr, and Bob Balaban are superb, and the script is wonderful. I'll never get tired of this movie. I'm going to Comic Con with Daisy, my 14-year-old daughter. Maybe we'll make it Saturday for the showing, and maybe I'll even talk Daisy into wearing her "Raptor" T-shirt. Scott Marks July 13, 2011 @ 9:09 p.m.
Start 'em young, that's what I always say, QP! I hope to see you there. bushidojohn July 14, 2011 @ 12:53 p.m.
Let's see if Scarlett will show up. And I'm here!